The Polideini (Tachinidae: Tachininae) as newly defined herein has a distribution throughout the Nearctic, Neotropical and Palearctic regions and comprises the following 36 genera, most of which are assigned to the tribe for the first time: Arctosoma Aldrich, Barychaeta Bezzi, Chlorohystricia Townsend, Chromatocera Townsend, Chrysotachina Brauer & Bergenstamm, Dichocera Williston, Dolichostoma Townsend, Ecuadorana Townsend, Ernestiopsis Townsend, Eucheirophaga James, Euscopolia Townsend, Exoernestia Townsend, Exoristoides Coquillett, Ganoproctus Aldrich, Homalactia Townsend, Hystricia Macquart, Lydina Robineau-Desvoidy, Lypha Robineau-Desvoidy, Lyphosia Mesnil, Mactomyia Reinhard, Mauromyia Coquillett, Micronychia Brauer & Bergenstamm, Mesembrierigone Townsend, Nigrilypha gen. nov., Notoderus Cortés, Ollacheryphe Townsend, Opsophasiopteryx Townsend, Ostracophyto Townsend, Petagnia Rondani, Punamyia Townsend, Pyrrhoernestia Townsend, Spilochaetosoma Smith, Tarpessita Reinhard, Telodytes Aldrich, Trichophoropsis Townsend and Xanthopelta Aldrich. 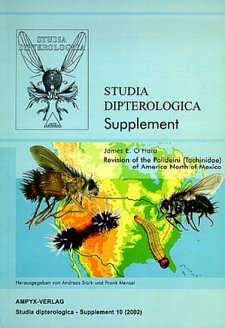 The Polideini of America north of Mexico, comprising 16 genera and 43 species, are revised. One new genus is proposed for one new species, Nigrilypha gnoma gen. nov., spec. nov., from the American Southwest. Chromatocera Townsend, Exoristoides Coquillett, Homalactia Townsend and Micronychia Brauer & Bergenstamm are removed from synonymy with Lypha Robineau-Desvoidy and reinstated as valid genera, status revived. The following new or revived generic synonyms are proposed for New World Polideini: Exoristopsis Townsend, Neoerigone Townsend, Mericina Curran and Helioplagia Townsend are synonymized with Chrysotachina Brauer & Bergenstamm, syn. nov.; Heliolydella Townsend, Heliolydellops Townsend and Myersimyia Townsend are synonymized with Exoristoides Coquillett, syn. nov.; Hystriciopsis Townsend, Hystriciella Engel and Engelomyia Townsend are reinstated as synonyms of Hystricia Macquart, syn. revived; Paradmontia Coquillett and Jalapamyia Reinhard are synonymized with Mauromyia Coquillett, syn. nov.; and Plagiosippus Reinhard is synonymized with Micronychia Brauer & Bergenstamm, syn. nov. The following new species are described from America north of Mexico: Chrysotachina auriceps spec. nov., Chrysotachina infrequens spec. nov., Chrysotachina longipennis spec. nov., Dichocera latifrons spec. nov., Exoristoides blattarius spec. nov., Exoristoides sabroskyi spec. nov., Lypha cristiverpa spec. nov., Mauromyia macrobrevis spec. nov., Micronychia woodi spec. nov., Nigrilypha gnoma spec. nov., and Ostracophyto flavicaudalis spec. nov. The following synonyms at the species level are proposed for America north of Mexico: Dichocera robusta Brooks is synonymized with Dichocera lyrata Williston, syn. nov.; Neodichocera tridens Walton is synonymized with Dichocera orientalis Coquillett, syn. revived; Homalactia brimleyi Curran and Homalactia facula Reinhard are synonymized with Homalactia harringtoni (Coquillett), syn. nov.; Tryphera polidoides Townsend and Polidea americana Townsend (1892b: 82) are synonymized with Lydina americana (Townsend, 1892b: 78), syn. nov., and the taxon is treated as an unresolved species complex; and Lypha intermedia Brooks is synonymized with Lypha setifacies (West), syn. nov. The following are new or revived combinations for New World Polideini: Chlorohystricia cussiliris (Reinhard), comb. nov.; Chromatocera fumator Reinhard, comb. revived, C. harrisi (Reinhard), comb. nov., C. setigena (Coquillett), comb. revived; Chrysotachina amazonica (Townsend), comb. nov., C. cinerea (Townsend), comb. nov., C. ruficauda (Curran), comb. nov., C. setifera (Townsend), comb. nov., C. slossonae (Coquillett), comb. nov., C. urichi (Aldrich), comb. nov., C. verticalis (Reinhard), comb. nov.; Exoristoides homoeonychioides (Townsend), comb. nov., E. johnsoni Coquillett, comb. revived; Hystricia alpina (Townsend), comb. revived, H. copulata (Wiedemann), comb. revived, H. cuestae (Engel), comb. revived, H. fumipennis (Engel), comb. revived, H. obscura (Townsend), comb. revived, H. ornatipennis (Engel), comb. revived, H. tarsata Schiner, comb. revived; Mauromyia brevis (Coquillett), comb. nov., M. callitris (Reinhard), comb. nov., M. picticornis (Reinhard), comb. nov.; Micronychia invasor (Reinhard), comb. nov., and M. maculipennis (Aldrich), comb. nov. Hystricia rufohirta Curran (1942), junior secondary homonym of Hystricia rufohirta (Engel 1920), is given the new replacement name Hystricia currani, nom. nov. A lectotype is designated for Eulasiona setigena Coquillett, a valid species of Chromatocera Townsend. The species Lypha setifacies of authors (not West) is the same species as Lypha fumipennis Brooks. A key is included to the 16 genera of Polideini that occur in America north of Mexico, along with a key to species under each non-monotypic genus. Each genus is characterized and each of the 43 species in America north of Mexico is described. Distribution maps are included for each species. Numerous illustrations are included as well as colour habitus images of 16 species. Host information is given where known based on published reports and new rearing records taken from collections. The monophyly of the tribe is discussed and the phylogenetic relationships among the genera and species of America north of Mexico are analyzed. Die Tribus Polideini (Tachinidae: Tachininae) ist, so wie sie in der vorliegenden Arbeit neu definiert wird, in den gesamten Regionen der Nearktis, der Neotropis und der Paläarktis verbreitet. Sie umfasst nunmehr die folgenden 36 Gattungen, von denen die meisten erstmals dieser Tribus zugeordnet werden: Arctosoma Aldrich, Barychaeta Bezzi, Chlorohystricia Townsend, Chromatocera Townsend, Chrysotachina Brauer & Bergenstamm, Dichocera Williston, Dolichostoma Townsend, Ecuadorana Townsend, Ernestiopsis Townsend, Eucheirophaga James, Euscopolia Townsend, Exoernestia Townsend, Exoristoides Coquillett, Ganoproctus Aldrich, Homalactia Townsend, Hystricia Macquart, Lydina Robineau-Desvoidy, Lypha Robineau-Desvoidy, Lyphosia Mesnil, Mactomyia Reinhard, Mauromyia Coquillett, Micronychia Brauer & Bergenstamm, Mesembrierigone Townsend, Nigrilypha gen. nov., Notoderus Cortés, Ollacheryphe Townsend, Opsophasiopteryx Townsend, Ostracophyto Townsend, Petagnia Rondani, Punamyia Townsend, Pyrrhoernestia Townsend, Spilochaetosoma Smith, Tarpessita Reinhard, Telodytes Aldrich, Trichophoropsis Townsend und Xanthopelta Aldrich. Insgesamt 43 Arten in 16 Gattungen der Tribus sind in Amerika nördlich Mexikos verbreitet und werden in der vorliegenden revidiert. Für eine neue Art, nämlich Nigrilypha gnoma gen. nov., spec. nov., aus dem Südwesten Amerikas wird eine neue Gattung eingerichtet. Chromatocera Townsend, Exoristoides Coquillett, Homalactia Townsend und Micronychia Brauer & Bergenstamm waren bislang als Synonyme von Lypha Robineau-Desvoidy geführt worden. Ihr ursprünglicher Status als eigenständige Gattungen wird wiederhergestellt (stat. revived). Folgende neue Synonyme oder wiederhergestellte Synonyme für die neuweltlichen Polideini werden vorgeschlagen: Exoristopsis Townsend syn. nov., Neoerigone Townsend syn. nov., Mericina Curran syn. nov. und Helioplagia Townsend syn. nov. als Synonyme von Chrysotachina Brauer & Bergenstamm; Heliolydella Townsend syn. nov., Heliolydellops Townsend syn. nov. und Myersimyia Townsend syn. nov. werden mit Exoristoides Coquillett synonymisiert; den Status als wiedereingesetzte Synonyma (syn. revived) der Gattung Hystricia Macquart erhalten die Genera Hystriciopsis Townsend, Hystriciella Engel und Engelomyia Townsend; Paradmontia Coquillett syn. nov. und Jalapamyia Reinhard syn. nov. sind neue Synonyma von Mauromyia Coquillett und schließlich wird Plagiosippus Reinhard syn. nov. mit Micronychia Brauer & Bergenstamm synonimisiert. Die folgenden Arten aus Amerika nördlich von Mexiko werden als neu für die Wissenschaft beschrieben: Chrysotachina auriceps spec. nov., Chrysotachina infrequens spec. nov., Chrysotachina longipennis spec. nov., Dichocera latifrons spec. nov., Exoristoides blattarius spec. nov., Exoristoides sabroskyi spec. nov., Lypha cristiverpa spec. nov., Mauromyia macrobrevis spec. nov., Micronychia woodi spec. nov., Nigrilypha gnoma spec. nov. und Ostracophyto flavicaudalis spec. nov. Folgende Synonyme auf dem Artniveau für Spezies aus Amerika nördlich von Mexiko werden vorgeschlagen: Dichocera robusta Brooks syn. nov. von Dichocera lyrata Williston; Neodichocera tridens Walton syn. revived von Dichocera orientalis Coquillett; Homalactia brimleyi Curran syn. nov. und Homalactia facula Reinhard syn. nov. von Homalactia harringtoni (Coquillett); Tryphera polidoides Townsend syn. nov. und Polidea americana Townsend 1892 syn. nov. von Lydina americana (Townsend, 1892). Letztgenanntes Taxon wird als derzeit nicht auflösbarer Artenkomplex aufgefasst. Des weiteren wird Lypha intermedia Brooks syn. nov. wird mit Lypha setifacies (West) synonymisiert. Folgende neue oder wiedereingerichtete Kombinationen [comb. revived] von neuweltlichen Polideini werden vorgeschlagen: Chlorohystricia cussiliris (Reinhard) comb. nov.; Chromatocera fumator Reinhard comb. revived, C. harrisi (Reinhard) comb. nov., C. setigena (Coquillett) comb. revived; Chrysotachina amazonica (Townsend) comb. nov., C. cinerea (Townsend) comb. nov., C. ruficauda (Curran) comb. nov., C. setifera (Townsend) comb. nov., C. slossonae (Coquillett) comb. nov., C. urichi (Aldrich) comb. nov., C. verticalis (Reinhard) comb. nov.; Exoristoides homoeonychioides (Townsend) comb. nov., E. johnsoni Coquillett comb. revived; Hystricia alpina (Townsend) comb. revived, H. copulata (Wiedemann) comb. revived, H. cuestae (Engel) comb. revived, H. fumipennis (Engel) comb. revived, H. obscura (Townsend) comb. revived, H. ornatipennis (Engel) comb. revived, H. tarsata Schiner comb. revived; Mauromyia brevis (Coquillett) comb. nov., M. callitris (Reinhard) comb. nov., M. picticornis (Reinhard) comb. nov.; Micronychia invasor (Reinhard) comb. nov. und M. maculipennis (Aldrich) comb. nov. Hystricia rufohirta Curran (1942) wird als jüngeres sekundäres Homonym von Hystricia rufohirta (Engel 1920) erkannt. Erstgenannter Spezies wird der Name Hystricia currani nom. nov. gegeben. Für Eulasiona setigena Coquillett, einer validen Spezies aus der Gattung Chromatocera Townsend wird ein Lektotypus festgelegt. Lypha setifacies auctorum (not West) ist mit Lypha fumipennis Brooks identisch. Bestimmungsschlüssel der 16 in Amerika nördlich von Mexiko vorkommen Gattungen der Polideini, sowie der Arten nicht monotypischer Gattungen komplettieren die Ausführungen zu den behandelten Taxa. Jede Gattung wird detailliert charakterisiert und jede der 43 Arten umfassend beschrieben und ihre Verbreitung auf Karten dokumentiert. Zahlreiche Strichzeichnungen sowie Farbfotos vom Habitus von 16 Arten ergänzen den Text. Ein eigenes Kapitel dient der Zusammenfassung von Informationen zu den Wirten der Arten. Sie gehen auf bereits publizierte Meldungen und neue Angaben zur Zucht auf den Beschriftungen des Sammlungsmaterials zurück. Die Monophylie der Tribus wird diskutiert und die Verwandschaftsbeziehungen unter den Gattungen und Arten der Polideini Amerikas nödlich von Mexiko werden analysiert.